Tinta Color Extension Add-in Conditioners with color pigment to intensify the hair color. Sunflower seed extract and LP300, a color stabilizer, insure the intensity and durability of the color. The conditioners provide care and leave the hair smooth and easy to detangle. 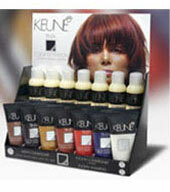 The "Add-In" Color Conditioners are for use between color services to refresh and add back lost pigment. The "Lock-In" Conditioner does not contain color pigment as is suitable to use on all hair types for protection. "Lock-In" Conditioner does not contain color pigment as is suitable to use on all hair types for protection.